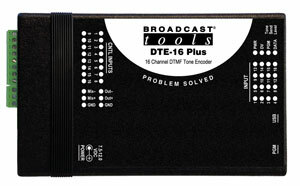 The DTE-16 Plus is a feature rich DTMF tone/sequence encoder that is user programmable to encode tone sequences up to 15 characters in length or a single tone via any one of 16 contact closure inputs and/or commands from the USB COM port. Each input may be programmed to generate a tone for the duration of the closure or tone burst immediately on command. A passive mixing network is provided to mix both program input audio and tone encoder audio if required. Programming is performed using a non-dedicated PC’s USB port equipped with Windows HyperTerminal or PuTTY. • Encodes all 16 DTMF tones or programmable tone sequences up to 15 characters in length. • Adjustable tone generation time. • Output level adjustable from +4 dBu to off. • Passive program mixer input. • Front panel status LEDs for all 16 inputs, power, tone activity, program mode, and serial data activity. • Programmed via USB connection. • All connections except for the USB type B connector and a coaxial DC jack are on removable euro-block screw terminal connectors to simplify wiring and service, mating plugs are supplied. • Surge protected power supply. Domestic power supply provided. • Up to four units may be mounted on the optional RA-1 rack shelf, using four supplied Velcro feet. Desk top and wall mounting is also possible.